New technologies available in cotton, soybeans and other crops were a hot topic of discussion during a recent field day at the Northeast Research and Extension Center. Tom Barber, Extension weed scientist for the University of Arkansas System Division of Agriculture, was one of four experts to speak to about 30 attendees at the mid-August event. Tom Barber explains the science behind the “See & Spray” technology to field day attendees in Keiser, AR. (Photo – University of Arkansas System Division of Agriculture). 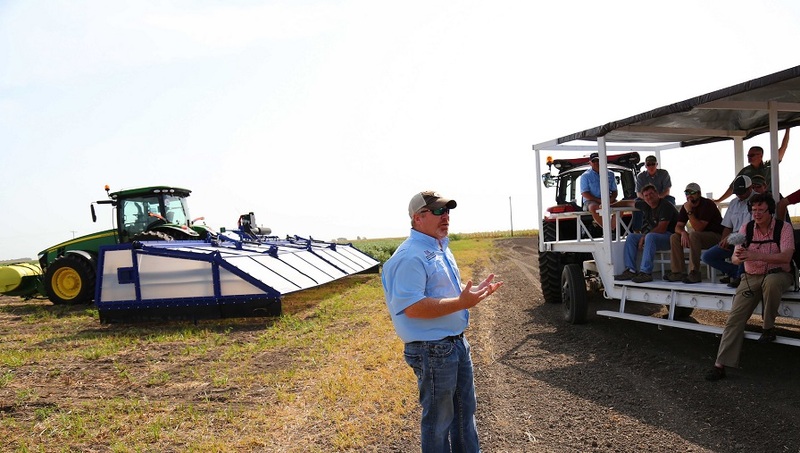 “It’s an exciting time to focus on new technologies and options that give us better pigweed control in cotton and soybean crops,” Barber said. “There are tools, from a genetic standpoint, where we have tolerances to herbicides we haven’t used in those crops before, and stacked tolerances, which haven’t been present in bean production systems. Several varieties of crops have been developed over the past few years that offer resistance to multiple pesticides, giving growers the flexibility to apply post-emergence herbicides based on the specific weeds they may be dealing with from one area of a field to the next. Barber said that at least one major manufacturer has said that a triple-stack herbicide tolerance will be commercially available as early as 2019. Also on display at the Keiser event was the “See & Spray” hooded spray application technology from Blue River Technology, a California-based agriculture technology company acquired by John Deere in 2017. The technology, mounted on an applicator rig, uses a combination of artificial intelligence to scan crop rows and identify weeds and a series of nozzles, spaced about 1.5 inches apart on a boom, to spray microbursts of pesticide on those weeds. It also incorporates a large hood spanning the boom, designed to reduce off-target drift. Barber said the Division of Agriculture is currently working with Blue River in an evaluative capacity, helping to refine the technology’s efficacy. While not yet widely available commercially, the See & Spray is being used in cotton on a limited basis, according to the company’s website. Barber said that the biggest challenge for cotton and soybean growers in the state remains Palmer Amaranth, commonly known as pigweed. 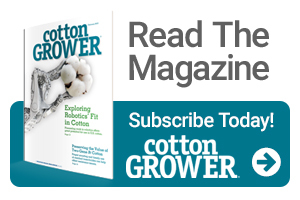 Several decades of increasing resistance have left growers with essentially three effective chemistries in cotton and soybean – Liberty, 2,4-D and dicamba, the last of which became the center of controversy after more than 1,000 complaints of off-target injury in soybeans were reported to the Arkansas Plant Board in 2017. Use of dicamba is currently banned between April 16 and Oct. 31.